The Sega Master System is an 8-bit, cartridge-based video game console that was manufactured by Sega and was first released in 1986. Its original Japanese incarnation was the Sega Mark III (although the "Master System" name has also been used in Japan). In the European market, this console launched Sega onto a competitive level comparable to Nintendo, due to its wider availability, but failed to put a dent in the North American and Japanese markets. 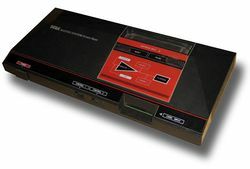 The Master System was released as a direct competitor to the NES/Famicom. Despite its shaky performance in the major territories, it enjoyed over a decade of life in smaller markets. With the use of the Sega Power Base Converter, all peripherals are fully compatible with the Sega Mega Drive. There are a variety of different controllers which can be used with the Master System. Depending on the game, one controller can potentially offer greater control and/or responsiveness. The basic controller has just a directional pad and two buttons; the first button doubles as the start button, and the pause button is found on the main unit. An upgraded version, called the SG Commander, has the same functions with the addition of rapid-fire options for either button. Some other controllers are the Control Stick, for greater movement precision; the Sports Pad, which is required for some games, but not supported in most; and the Handle Controller, for racing and flying games. The Light Phaser is a light gun created for the Sega Master System, modeled after the Zillion gun from the Japanese anime series of the same name. The phaser is heavier than its Nintendo counterpart, the Nintendo Zapper and is considered by some to have a more responsive trigger and more accurate targeting. As with the Nintendo Zapper, the Light Phaser looked realistic enough to warrant parental pressure to alter the device so that police would not confuse it with a real gun. Altered Light Phasers are distinguished by a hand-painted neon orange tip and are much rarer than their solid color counterparts. Tec Toy also released a blue Light Phaser in Brazil. The Mega Drive/Genesis is backwards compatible with the Master System, despite having a differently shaped cartridge slot. Sega developed a pass-through device for the Mega Drive/Genesis, allowing Master System cartridges to be played on the newer system. It was called the Power Base Converter in the US, the Mega Adapter in Japan and the Master System Converter in Europe. The somewhat large device plugs into the Mega Drive's cartridge slot, covering the entire circular top of the system. Master System cartridges and cards can then be inserted into the device and played on the Mega Drive using Mega Drive controllers. Due to its size and shape, the converter will not fit properly with the Mega Drive II, necessitating the use of the Europe-only Master System Converter II, or a third-party converter cartridge. The Rapid Fire Unit allows you to add rapid-fire functionality to the standard Control Pad, the Control Stick and the Light Phaser. Rapid-fire is useful in shooter games, such as R-Type, the first Sega Master System to have rapid-fire compatibility. The 3-D Glasses use small LCD screens to rapidly alternate between the left and right lenses being opaque, used in tandem with two different alternating images flashed from the TV synchronized with the switching of the 3-D Glasses to create a natural stereoscopic 3D effect. The Master System glasses can only be used in the original Master System, since it hooks up directly to the card port not found in the Master System II. Such a system allows 3-D graphics in full color. The technology takes advantage of the fact that televisions display an interlaced image, displaying the left image in the top frame and the right image in the bottom frame, so it tends not to work with non-standard televisions and most capture cards, which tend to combine fields. The same technique has been used with similar glasses for some 3-D films in movie theaters, though these have largely been replaced by newer methods that would not work on a home TV. Only eight Master System games are 3-D compatible. SMS games come on cartridges and on Sega Cards. Control Pad for the Sega Master System. SG Commander controller, with auto-fire capability. Alternate controller with joystick, the Sega Control Stick. Alternate controller with trackball, the Sega Sports Pad. Alternate controller for driving/flying games, the Handle Controller. Sega Light Phaser accessory for light gun games. Power Base Converter for playing SMS games on the Genesis. Rapid Fire Unit for Control Pad, Control Stick and Light Phaser. SegaScope 3-D Glasses accessory for 3D games. Snail maze game, playable by powering on the SMS without inserting a game. Pages in category "Sega Master System"
This page has been accessed 26,495 times.